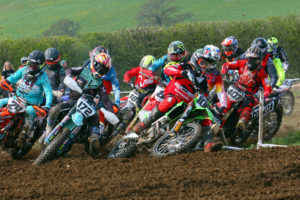 The first round of the 2019 British Minibike Championship’s was the dawn of a new era for the series, with a new race format for the main 160s, the scrapping of some classes and the introduction of others. While there was change all around, one constant was the sheer class of Robbie Daly in the Kids 50cc group. The reigning champion was in supreme form notching up all 6 race wins over the weekend to stand proudly on the top step of the podium on Sunday afternoon. The class is getting big and certainly more competitive and that showed with the super talented Riley Ray Barrow coming second ahead of Mason Flynn in third. Ethan Georgiou looks a genuine podium contender this year with 4th, ahead of Otto Hookam in 5th, and Harry Dearle 6th. The newest class was the Kids 65cc, and it was packed with talent and delivered great racing, and it was Ben Casey who made it into the record books as the first ever winner with a tremendous 6 race win max. Blake Ward-Clarke is another with speed for miles and finished second just ahead of Drew Stock in third. Riley Francis had a good weekend for 4th, with Alfie Best 5th and Max Pridmore 6th. Harry Lee looks the business in the Youth Junior category which is a bit depleted with a mass exodus moving up into the Senior class. That takes nothing away from Lee who put in a sublime 6 race win performance. Harris Goddard rode well all weekend for second, with Ben Johnstone third. With the top three from the Junior class moving up into the Seniors, all was set for a clash of the titans in this group. Harry Streeter was runner up last season, but with the bit between his teeth, he is going all out for the title in 2019 and he rode a stormer to take the overall. The competition was fierce though, and Freddie Hills who was last years bronze medalist took two race wins and second overall. Jake Speller’s move up a group is certainly not phasing him and he edged out his old rival and last years Junior champ Leo Vowles for third. Vowles showed his cards though by taking the Moto 5 win, and has shown he will be a threat for the title. With the 110 and 140cc classes been axed, all of the Adult focus was on the 160 class which comprised of five blocks of point scoring races, which in turn decided if a rider made the A, B or C final with the points of all 6 races being counted towards a riders championship standings. Two of last years front runners, Brad Pocock and Mike Valade were not on the grid, but they were ably replaced by some hot young talent making their move up from the youth ranks, and GP Cube/Red Circles French Ace Kevin Llamas. Within the 160’s the Vets, Masters, Stock Mod and Super Stock classes were scored seperately but they still score points in the main overall championships. In the Masters Jody Burton is going to take some stopping in 2019 mixing with the best 160 racers he racked up a good points haul to take the win and the championship lead from reigning champion Lee Mitchell who was racing like a legend in the A final only for his bike to blow on the penultimate lap. Matt Chamberlain and Jody Barnes battled in out for the third spot with Chamberlain getting the nod by a point on the day. Chris Rose is in no mood to relinquish his Vets title, and showed there is still life in the old dog yet by qualifying through to the A final which gives him a big lead in the championship over second placed Phil Thomas, with Jonathan Maw 3rd. In the Stock Mod category, Simon Vowles was the victor, while Oscar Stearn stole the crown in the new 110 Super Stock class. The battle at the head of the 160 class is an intriguing contest, with a whole new load of heroes stepping up to the plate and thriving under the new format, including young guns Ewan Goddard, James Lee and Louis Dutton. Throw into the mix the experience of Jody Burton and the pure talent of Blaine Blackwell, Dom Forman, Dave Lamb, Ash Gorman and new boy Llamas, where the title will go is a tough one to call, with riders needing a combination of good heat races and a strong A final to be in with a chance. As the top 28 riders gathered for the A final it was Blackwell and Llamas who looked the strongest in the heats, but it was the Frenchman who made to the front early doors and took the win and who tops the standings after round one. Lamb also showed well from the outset and held out for an excellent fourth in the race behind Dom Foreman who ride a stormer for second and Ash Gorman, making a succesful full time move into the 160’s in third. Jody Burton was the top Masters rider in 5th, with Blackwell 6th. Blackwell’s heat point scoring means he sits in second in the standings though and within striking distance of the series leader. In the B final Daniel Fisher stole a march on Scott Pohlman for the win, with Callum Radford in third, while in the C final Oscar Stearn took the chequers from Craig Powell and Simon Vowles. The next MBC meetings are the Minibike of Nations on Friday the 21st April and the Minibike World Championships on the 22nd and 23rd April all at Kieradan Park, near Scunthorpe.